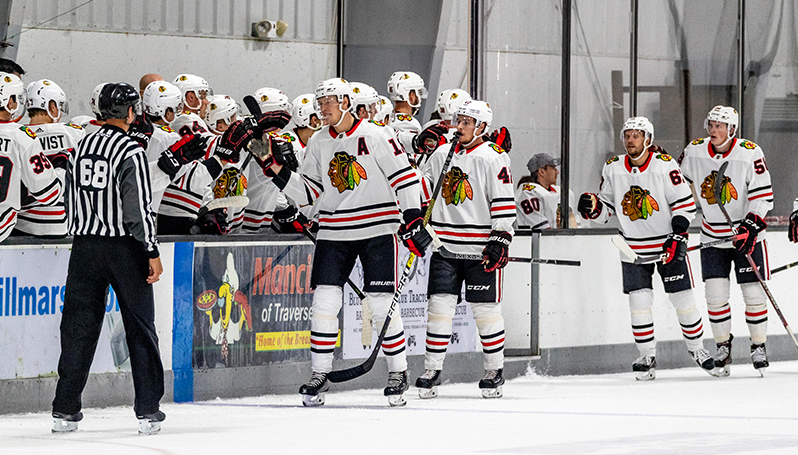 TRAVERSE CITY, MICH – Victor Ejdsell scored two goals, Alexis Gravel stood tall with 23 saves and the Chicago Blackhawks prospect team cruised to a 5-2 win over the Carolina Hurricanes in the second game of the 2018 NHL Prospect Tournament Saturday afternoon at Centre Ice Arena. Ejdsell snapped Chicago’s 0-for-5 power-play drought from the tournament-opener, sending a blast from the point into the back of the net just 25 seconds into the second period. Fellow Blackhawks forward Alexandre Fortin then converted on the very next power-play opportunity, pouncing on a rebound right in front of the net to give Chicago a 2-1 lead early in the second frame. Ejdsell then capped his two-goal effort by sniping a puck past Jeremy Helvig to buff the Blackhawks’ lead to 3-1. With Ejdsell’s second marker of the game, Chicago completed a three-goal surge in the second period that led to the Blackhawks outshooting the Hurricanes 20-9 entering the final stanza. Gravel took over through the conclusion of the victory, making several crucial saves while helping the Blackhawks squad kill off six of Carolina’s seven power-play opportunities. The netminder was breached only once after the first period when the second overall pick from the 2018 NHL Draft, Andrei Svechnikov, wired a shot in from a faceoff win to make the score 4-2. Dominik Kahun also scored his first goal of the tournament in the win for Chicago and Nicolas Beaudin iced the victory with an empty-netter with just 57 seconds remaining in the contest. Don’t miss a moment of the action by reserving your seats for the IceHogs’ 20th season of professional hockey in Rockford and 12th as the top AHL affiliate of the Chicago Blackhawks. The IceHogs’ home opener is set for Oct. 13 and ticket packages begin as low as $105 for a seven-game mini pack. Please contact us at (815) 847-6399 or visit icehogs.com to claim your spots for this upcoming season.